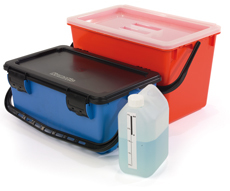 The Mopmatic box is totally unique (patent applied for) allowing for 10 loop or microfiber mops to be uniformly impregnated by the simple addition of the approved cleaning/disinfecting solution. By following these 5 simple steps you enable your operators to have an almost constant supply of clean mops to carry out the task at hand. 1. Load the mop box with 10 clean mop heads. 2. Pour the solution into the central automatic dispensing reservoir. 3. Snap on lid and leave for 15 minutes… then turnover and leave for another 15 minutes. 4. Remove lid, take one mop head and attach to mop, replace lid. 5. After use place dirty mop in red bucket which can hold approximately 20-25 dirty mops.